Usually, litter box training for adult cats is surprisingly easy. Felines are very fastidious animals and keeping things clean definitely appeals to them. Here are a few pointers to make sure you're successful with your new feline companion. Adult cats know the score. They naturally love to dig, and they instinctively want to bury their waste. In all likelihood, your new kitty will arrive at your home already litter box trained, or "house trained." So, often all you need to do is show your adult cat where the litter box is. If you follow the guidelines I've laid out for bringing home a new cat, your new kitty will be in her carrier for a while and in her "safe place"; and you'll have a nice clean litter tray with fresh litter ready and waiting for your new family member. Some cats are ready to leave the carrier right away, but it will be best if you can keep her in the carrier at least long enough for you to show her where the litter tray is. When it's time to let your new adult cat out of the carrier, or, if your new kitty is brave and ready to leave the carrier right away, you can pick him up and put him in his cat litter box to show him where it is. Of course, this will be a lot easier if you have an open box, as opposed to a covered or hooded one. You may want to gently lift a paw and scratch at the litter just once or twice. You don't need to force him to stay there. He'll know what it's for. For most cats, this will be all the training required, especially if you've chosen the "right" location, litter, and type of box (also known as a "pan" or "tray"). Discipline for Litter Box Training? If you've ever heard that you should rub your cat's nose in her accident, erase that from your mind and never consider it. Seriously. And if this is something you would consider doing anyway, then please, please don't adopt a cat or kitten. Rubbing your cat's nose in it is cruel behavior, and it is counter-productive and ineffective. Yelling or shouting at your cat for a mistake while she is in the middle of making it will only cause additional problems, especially for kittens, who will associate the yelling with going potty itself, and not the location. This will also cause her to look for secret places to do her business. "Discipline" after the fact does not work for an adult cat or kitten. While the furry little critters are smart little ones, they will not be able to associate the "discipline" with the deed after the fact. That is, taking your kitty to the "accident" and rubbing her nose in it or yelling at her just won't make sense to her. She won't make the connection, and she will probably fear you. Just clean up the mess thoroughly and follow the suggestions above for cat litter box training. Frankly, if you do a good job of training, your feline friend will get it. And finally, potential health problems of your kitty. In short, "discipline" is counter-productive, ineffective, and cruel. Time to Contact a Veterinarian? If your cat has always used her litter box with no problems, and all of a sudden she stops using it, you should consult your veterinarian immediately. 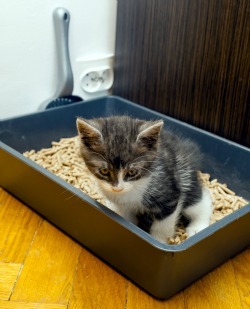 Kitten Litter Box Training – Special considerations for house training kittens. Cat Litter Box Essentials – General information about this whole "messy" area.